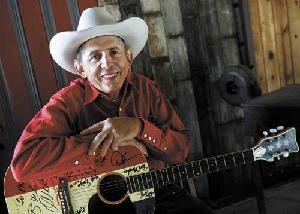 Monte Mills, who lives in Creston, has a string of shows in the county this month. The names dotting country singer Monte Mills' red, white and blue guitar would make any autograph hunter proud: Buck Owens, Dwight Yoakam, George Jones, Willie Nelson. Some of the stars he's played with, like Merle Haggard. Others are genre icons, former members of Sons of the Pioneers and Asleep at the Wheel. For Mills, who lives in Creston, those signatures are souvenirs of a 30-year career spent performing for future U.S. presidents, celebrities and Cal Poly students on the Central Coast. His Lucky Horseshoe Band plays at Paso Robles' Twilight Concerts in the Park series on Friday, followed by similar shows in Grover Beach on Sunday and Templeton on Aug. 30. "It's tenacity, or stupidity, I guess," Mills, 60, said with a chuckle. "You'd think we'd want to do something else, but we still have fun with it." A true singing cowboy, Mills considers the Lucky Horseshoe Band a "side job" compared to his full-time occupation as a horseshoer. He sports Western-style Wrangler shirts, work jeans and boots, and occasionally one of a half-dozen white cowboy hats. His answering machine message starts with a yodel. Growing up in tiny Olathe, Colo., Mills was more interested in becoming a world-champion calf-roper than pursuing a career in country music. He listened to "everything," he said, from crooner Perry Como and Western swing pioneers Bob Wills & His Texas Playboys to early rock 'n' roll icon Elvis Presley. "I was in sixth grade when Elvis got big," he said. "That pretty well knocked everything off the radio." By the time Mills graduated from college in Durango, Colo., the Vietnam War was in full swing. To avoid being drafted into the infantry, Mills joined the U.S. Naval Construction Force (also known as the Seabees) and served a little more than two years in the military. He moved to San Luis Obispo County in 1972 and started a horseshoeing business. In 1974, Mills got the contract to shoe horses for Rancheros Vistadores, a group of politicians, ranchers and other well-heeled folks who meet outside of Santa Barbara every year for a seven-day ride into the wilderness. Mills brought his guitar along and found himself performing for then-Gov. Ronald Reagan. "He sure kept everybody captivated," Mills said about the future commander-in-chief. "He would keep people spellbound with his stories because he could really tell a good story. He'd have everybody laughing." Meanwhile, Mills' playing became so popular that some of the ride participants urged him to record an album. He went down to Hollywood the next year to lay down tracks with some session experts. "I was just thinking, ‘This is it. It's time to put up or shut up,' " Mills said. "I was very nervous about the whole thing." Immediately after "Monte Mills Sings Old Favorites" hit the record stores, though, offers for gigs started pouring in. Mills formed the Lucky Horseshoe Band with two other horseshoers. Although the lineup keeps changing, the band itself has remained active ever since. One alumnus, Templeton native and harmonica player Mike Caldwell, performed with Loretta Lynn and Boxcar Willie before becoming music director of the traveling stage show Country Tonite. According to Mill, the Lucky Horseshoe Band's blend of country standards, gospel and rock 'n' roll seem to capture people's attention. "People like something they can depend on, that's familiar to them," he explained. "I was always attracted to music that was a generation before me." The Lucky Horseshoe Band played for Cal Poly agriculture students at F. McLintock's Saloon in San Luis Obispo for 27 years. Other regular gigs include Mule Days in Bishop (22 nonconsecutive years) and the Parkfield Rodeo (14 years). Mill's band also has frequent brushes with celebrities, such as Robert Mitchum, Red Skelton, Cheryl Ladd and Kenny Rogers. Once, Monte led a 10-piece band performing with "Footloose" singer Kenny Loggins at the Santa Barbara Polo & Racquet Club. The musicians rehearsed Loggins' songs so many times even the singer was impressed. "After he got through singing a couple times, he said, ‘Dammit, you know them better than I do,' " Mills said with a laugh. Still, Mills said, the greatest thrill of his career came when the Lucky Horseshoe Band opened for country legend Merle Haggard last summer in the San Joaquin Valley. "I can remember what I was doing, where I was, what year it was, from what Merle Haggard song was on the charts at the time," said Mills, adding that he owns all of the prolific songwriter's 80-plus albums. "His voice is incredible — always on pitch, always has the right emotion," he added. "I've been trying to sing for 30 years ... I can't even warm him up." Mills doesn't have any plans to slow down. The Lucky Horseshoe Band still plays about 50 gigs a year, from rodeos and barn dances to graduation parties and weddings. He's also in the process of recording a country album with Los Alamos rancher Bill King. A 30th anniversary album, much like 1996's "20 Years," might be in the works, Mills said. "It seems like we're just getting started," he said with a laugh. 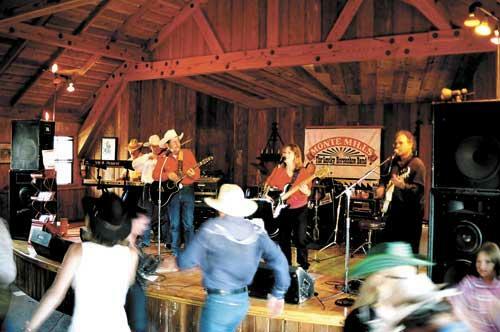 Monte Mills and the Lucky Horsehoe Band performing at the Hospice 'Pardners' Hoedown at the Hearst Ranch last Saturday.